These high quality smokers are capable of producing huge volumes of deliciously smoked meat, fowl or fish and can amply feed the largest crowds. Manufactured of the finest quality #304 stainless steel, these units are built with safety and economy in mind. Both models shown here come with a thermostat control and a convection fan system. These special features will consistently provide a low, even cooking temperature, the key to significantly reducing product shrinkage and labor costs. Thermostat Control: Regulates temperature for even, controlled cooking. 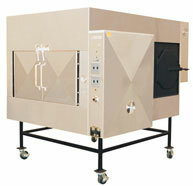 Convection System: Thoroughly moves heat and smoke, thus producing fantastic product consistency. Drive System: Heavy-Duty chain drive system provides ultra smooth rotisserie motion. Revolving Racks: Continuous rack rotation provides even smoking, and the self basting effect of meat dripping on meat, for unbelievable flavor. Gas Starter: A completely automatic thermostat and electronic ignition system provide an even controlled burn. Insulation: Mineral wool type insulation allows greater energy efficiency. Firebox: Designed to accommodate regular fireplace size logs. Two logs provide 6 hours cooking time. Safety Features: Upper limit temperature switch prevents inside temperature from exceeding 350°F. Opening of doors will automatically shut down the burner and stop the rotisserie motion. Units are also equipped with a pilot check feature. Portability: Every unit can be fitted to a mobile trailer for easy transport. For information on larger Smoker units or trailer mounted units which come in various lengths, and range from basic to fully equipped, please call our Customer Service Department at 1-800-323-5664. 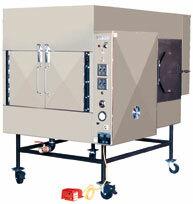 These smokers can also be specifically manufactured to meet USDA specifications.